Environmentally-Friendly Solar Powered:use solar panel to charge on the day.Automatically turns on at dusk. Muti-Color Lighting in Garden/Yard: the solar lights have a classic design,glows beautiful cool tones radiate from the glass globe solar lights,changing with yellow, green, purple, pink, orange, blue and red 7 colors, perfect for garden or yard decorations. 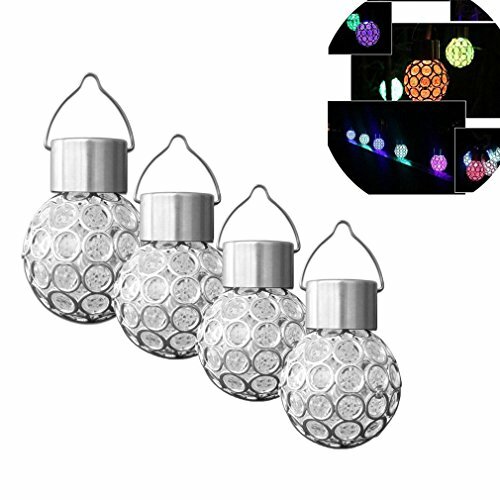 Waterproof & durable and shockproof design:the changing color lantern ball garden fence landscape hanging patio lamps are made of stainless steel and hard plastic rain, snow, ice and wind, these LED accent decorative lights works well in all season.it was protected by the steelness net,is hard to broken. Easy to use and installtion:The color changing solar lights just need you hang it in the sunny place,then you can use it in outdoor or home window,garden. Muti-function:nice lawn lamp for path, garden, courtyard ,outdoor,camping.